In 1890, at the request of the North Minneapolis Improvement Association, a horse-and-buggy tour sang the praises of the North Side to Minneapolis librarian Herbert Putnam. Putnam reputedly had said that only six books had gone “north of the tracks” in the previous month, and had to be convinced of the growth of the area before he would allow a branch library to open there. A small room in a basement of North High School (then located on the northeast corner of 18th and Emerson) was the first library space, and a limited number of books were available for both the students of the school and the residents of the community. When the school needed the space, the library moved to rented quarters until this site, valued at $6,000, was donated by Samuel Gale and State Supreme Court Judge C.E. Vanderburgh in 1892. This red brick library was opened in 1893 as the city’s first branch library, and continued to operate until 1979. 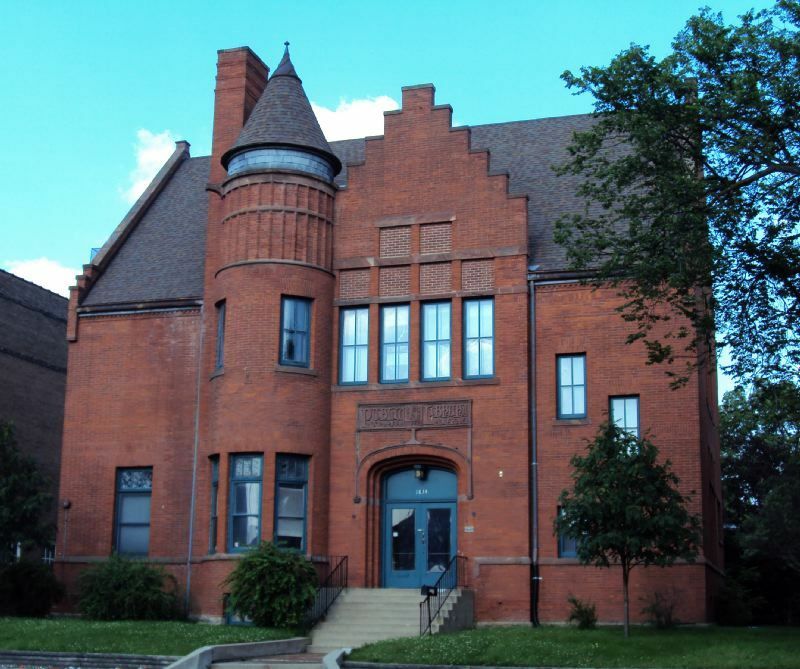 It was the first building in Hennepin County to be built as an open-shelf public branch library, and according to historians, possibly the first in the nation. It is the oldest existing building in Minnesota that was built as a library. The building’s current owner is a non-profit organization named Emerge Community Development, whose programs serve low-income community residents seeking employment, training, and housing opportunities. Emerge finalized the acquisition of the building in 2009 to create the Emerge Career and Technology Center, following the successful co-redevelopment in 2007 of its headquarters across the street to the north in an 1890 commercial building at 1101 West Broadway. Emerge has successfully raised $6.4 million to renovate the former library building. The North Branch Library building is on the National Register of Historic Places. It was built in a towered brick Richardsonian design by North Side resident and architect Frederick Corser, and opened as a library in 1893. Corser also designed three other buildings on the National Register, including Wesbrook Hall at the University of Minnesota in 1898 (demolished 2011). Corser designed a red-brick building with a “basket arch” entry, with sculptural stone and terracotta ornamentation. The masonry opening of the main entry door has a very shallow series of brick arches that cascade as they recess to the back depth of the opening. Above the entryway, a carved stone panel has Art Nouveau lettering ("Public Library A"--meaning Branch A) in cast-iron trim, with Art Nouveau patterns of curling vine forms. Over the panel are four tall windows with stone heads that supported a series of square windows above. These are now bricked in. Where the brick meets the roof, the brick pattern has two courses slightly projecting and a middle course of diagonally-projecting brick in a sawtooth pattern. The brick was laid in "buttered" joints. In this technique, bricklayers made the mortar quite soft, so that joints could be thin. The use of this delicate technique faded over time, and thicker joints became much more typical in later buildings. The center part of the facade slightly projects out on the right-hand side, with windows in an interesting, almost-random pattern to accommodate the stairway inside. On the left-hand side, the facade forms a half-round tower with large windows and decorative glass transoms. The library's side-gabled, steeply-pitched roof sits atop a façade dominated by a prominent, round tower with castellation (meaning “in the castle-like spirit of turrets and battlements”) detailing to the south. The façade features tall, narrow windows, some in multiple groups and with multi-pane glazing. A massive chimney sits just north of the tower. Look for hidden, irregular brick patterns, using both vertical and horizontal brick, that seem to be randomly placed throughout; and the miniature, gargoyle-like stone face features on either side of the front entrance. 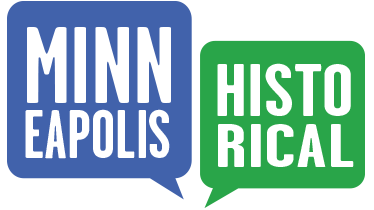 Old Highland Neighborhood Association, “1834 Emerson Avenue North: North Branch Library,” Minneapolis Historical, accessed April 22, 2019, http://minneapolishistorical.org/items/show/37.